Jazz quartet featuring vibraphone, trumpet, bass and drums. It swings, it's funky, and it's tasty as a well-mixed sake martini. Another all-original recording, drawing from bossa nova, standards and even brass band influences. 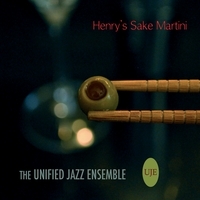 Henry's Sake Martini, is the Unified Jazz Ensemble’s ninth recording. The UJE’s repertoire changes and grows with the input of the band members, and the music you hear on this recording came about through years of ensemble direction, as well as individual input. Following nearly 20 years of performance experience, this album represents the unique sound and playing style of four diverse and seasoned musicians. Tim Stanley, a Grammy award-winning trumpet and flugelhorn player, joins the group for the first time in this recording. Dominic Smith, one of the most in-demand drummers in the D.C./Baltimore area, grounds the album along with John Pineda, UJE’s set-the-groove bassist for more than 15 years. Mike Noonan, UJE’s founding leader and award-winning performer, plays vibraphone and composed all tracks on the album. While the styles vary, all tracks feature solid ensemble playing, stellar solos, and melodic tunes that are likely to leave listeners humming hours later. "While these compositions were written over several years, the band has really breathed new life into them with this recording," says UJE leader and composer Mike Noonan. "Live performance is what it's all about for us, so recording can be tough. This one was seemless, even enjoyable to lay down. We're proud of the result." Recorded at the historic Garrett-Jacobs Mansion in Baltimore, MD on March 7, 2011 by Medford Canby, Front and Center Live Recording, frontandcenter@verizon.net. Mixed by Medford and the UJE and mastered by Bill Wolf. Produced by the Unified Jazz Ensemble. Mike Noonan plays and endorses mallets by Innovative Percussion, Nashville, TN. CD Design and photos by Kari Watts.